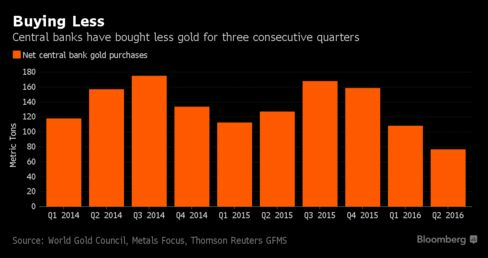 The biggest owners of gold are tiring of the metal. Central banks — holders of about 32,900 metric tons of bullion — cut their purchases by 40 percent during the three months through June, compared with the same period a year earlier, to the lowest since 2011, World Gold Council figures compiled by Bloomberg show. It was the third-straight quarterly drop, the longest such streak in at least five years. Buying declined in 2016 as prices were rallying for their biggest first-half gain in 40 years. Central banks in emerging-market nations have been adding less gold as the amount of cash they get from exports declined, said John Nugee, a manager of Bank of England reserves in the 1990s. Central banks have been a bullish influence on gold, especially after the financial crisis, when prices rallied to a record high in 2011. Before then, government bullion reserves had been dropping for almost two decades. But central banks have been net buyers every year since halting the selloff in 2008, and as of June had the biggest hoard in almost 15 years. The recent slowdown may signal buyers’ fatigue, especially for countries with fewer exports. Through April, global trade in general has fallen to the lowest since 2010, according to the International Monetary Fund, while currency reserves are down almost 8 percent from a peak two years ago, data compiled by Bloomberg show. A prime example is China, which has amassed the world’s fifth-largest gold reserves as it became the world’s second-largest economy. Weaker exports are curbing cash inflows the government invests in assets such as Treasuries and bullion. The current-account surplus, which reached a six-year high in the middle of 2015, fell by more than a quarter in the past year. 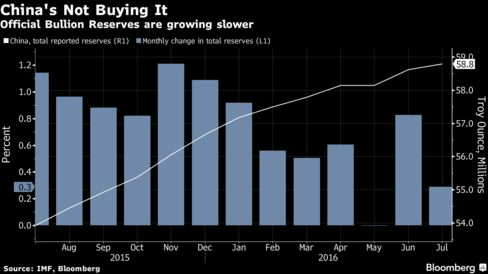 Its currency reserves fell by one-fifth from about $4 trillion in 2014. In May, China reported no gold purchases. After bouncing back in June, the central bank’s buying in July was at the second-slowest rate in a year. That removes a key support for gold prices. After a spectacular 25 percent surge during the first half, the metal is little changed, trading at $1,323.86 an ounce on Tuesday, down 3.7 percent from the year’s high in early July. Even with emerging-market exports under pressure, countries with large current-account surpluses including China and Russia still need ways to diversify their currency reserves. With yields on alternatives such as government bonds falling into negative territory in parts of the globe, gold remains an attractive hedge for their central banks. That’s one reason why the accumulation will continue, according to the World Gold Council, an industry lobby group. Russia has nearly quadrupled its hoard since 2005 and owns the most since at least 1993, International Monetary Fund figures show. The country is boosting holdings to diversify its reserves, central bank Governor Elvira Nabiullina said last year. While sovereigns purchase as much as 550 tons of gold a year, they can be more fickle than jewelry buyers. From 1989, central banks were net sellers for 19 straight years, offloading a combined 5,828 tons, more than held in Fort Knox, according to IMF data. In the first six months of 2013, 21 countries from Mozambique to Mongolia increased gold holdings. This year, the number fell to 10, with only four buying more than a ton. Some have turned net-sellers. Venezuela’s international gold reserves slumped 25 percent in the first half of the year as it fended off a foreign-currency crisis. Higher prices also may also deter buying. China previously bought more when prices dipped, said Eily Ong, a Bloomberg Intelligence analyst in London.